This has been a kind of amazing summer for travel but my trusty phone, which I use to post remotely, is on its last legs. This week I’ll be travelling around Newfoundland and hoping that the phone will last the trip. That means I may not be able to write much but I sure will be drawing. The first stop: the tiny outport of Quidi Vidi – as picturesque a village as you could ever imagine. I think I would love Newfoundand..
Hope the phone keeps working! I think you would love it too! Newfoundland, such a wonderful place. Thanks for allowing us to travel alongside your sketches and have a safe journey. Wonderful! I recognized the name in the subject line, then immediately remembered the spot when I saw your effect sketch. I have been to this little bay and you have captured it beautifully. It is a beautiful place, isn’t it? Thanks Alison! Hope you are planning a future workshop there.. I’m in …. I’m still hoping for Fogo next year! Beautiful painting, and that is one well placed bird. i would’ve flubbed that one unless i practiced it on a spare sheet. even then, no guarantee. I had another one in there in front of the mountain but I painted over it by mistake! So I flubbed it too. 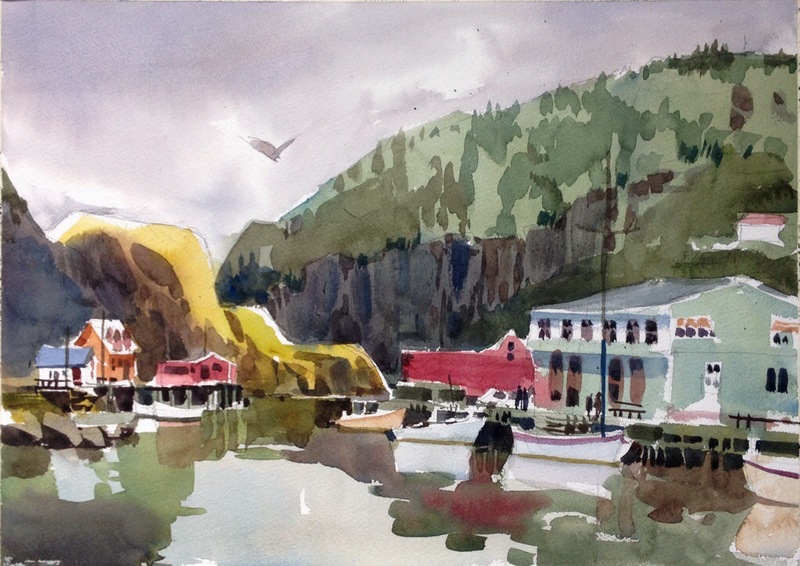 We just got back from a trip to Western Newfoundland and I painted every day that I was there. I am so glad to see your paintings as the colours are much more muted in Newfoundland than much of the paintings I have seen you do and I was interested to see how you would capture the scenes I was seeing and now I get to do just that. Have a wonderful time – wish I was there again right now! We have had great weather here and every day is hot! Not what I expected here. The colours are certainly more muted here than out west where there was often a dark backdrop of trees. I am loving this province and it’s great to hear that you painted here as well.